In this report from RTÉ News (Wednesday 25th June) it appears that the remaining houses (except one) in a development in Co Louth will be demolished due to pyrite affected blockwork. Previously it had been reported demolition had commenced on a small portion of the development. An entire social housing development under construction in Co Louth will have to be demolished following confirmation that all but one of the homes is contaminated with pyrite. The 25-unit housing scheme is a partnership between North and East Housing Association and Louth County Council. The alert was raised in April when the housing association’s technical staff noticed cracks in the walls of six of the houses at Moneymore in Drogheda. A detailed examination found that the cracks resulted from under floor filling containing pyrite, which caused the material to expand and cracked the block work. The results of a second phase of tests have now confirmed that a further 18 units have been contaminated with the mineral. Demolition has already begun on the first six homes. Building contractor Andrews Construction and North and East Housing Association have now agreed to knock and rebuild all 25 units in the development. The additional cost arising from the demolition and reconstruction will be borne by the builder and their supplier. The need to demolish and rebuild the houses will mean a further nine-month delay for those on the council housing list hoping to secure one of the units. 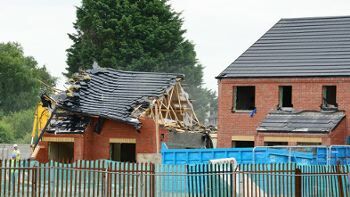 Breege Dolan, acting CEO of North and East Housing Association, said: “We had hoped to deliver the 25 houses in November 2014 but it will now be August 2015 taking account of demolition and rebuild works.